I go through museli-making phases. What happens is I forget how delicious homemade muesli is and get really into making it for a wee while, but I soon remember the reason I stopped making it the last time… because I’m just not that big a breakfast person. A piece of cold toast with Marmite in the car to work is more where I’m usually at. I do love a bowl of muesli with fresh fruit and yoghurt every now and then, but every morning is too much for me. In any case, there are other people in my house, and they like a bowl of muesli every now and then too, so I whipped some up the other day and someone on facebook asked for the recipe. So here it is (in as much as you can call it a recipe – no real measurements, sorry!) And speaking of facebook, come over and like me if you don’t already! I often post quick pics and deep and meaningful status updates you don’t want to miss. In a big roasting pan, lightly toast a good amount of whole oats – an 800g pack, say. You can add a bit of honey or maple syrup, or as I did rather deliciously this time, a drizzle of Heilala vanilla syrup. Tip the toasted oats into a big bowl – don’t skimp on size here, you need a really big bowl to be able to combine everything nicely. Next toast your choice of nuts and seeds – whatever you like, really. I had peanuts, cashews and pumpkin seeds in the pantry, so I used them. At this stage don’t add small seeds like linseed or sesame as they’ll burn before the nuts toast – do the small things last. 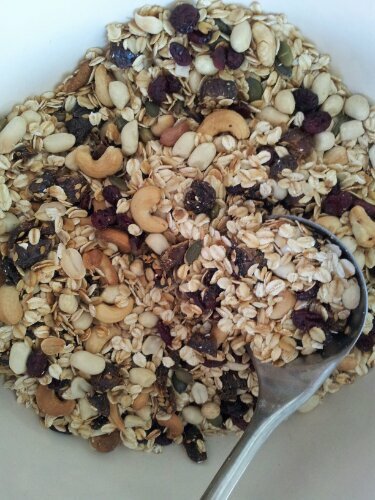 Add toasted nuts and seeds to the oats, then continue toasting any smaller seeds. This time I threw in my linseed raw, along with some black chia. Then lastly add some dried fruit – in my case that was chopped dates and cranberries. The ratios are up to you, of course. I like to have a good amount of nuts for flavour and texture, and I don’t add coconut anymore because my three year-old turns her nose up at it. But if adding coconut, toast it at the end with the smaller seeds.After everything is nicely combined in your big bowl, transfer the muesli to a big airtight container (I use a big jar with a cork lid). Of course there are all sorts of other things you can play around with adding to your muesli – bee pollen, LSA, goji berries, dried cherries. Let the shelves of your local wholefoods store provide inspiration. My advice is, if you start to feel the chewing is becoming an effort, ditch the muesli for a while and go for a piece of cold toast. Variety is the spice of life.